A Trip To The Dentist Can Save Your Life! Did you know that most people visit their dentist more frequently than their primary care physician? 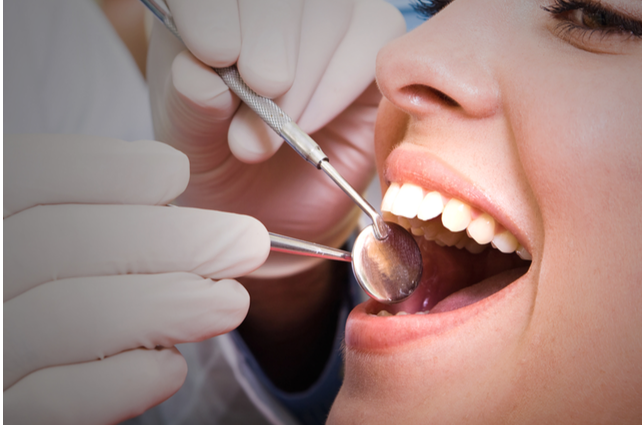 It is recommended that patients go to see their dentist two times a year for a regular dental check-up. On the other hand, most people visit their physician only once a year for a check-up. Some may not visit their physician until they have an injury or illness, which could lead to multiple years in between visits. Because most people spend more time with their dentist, it is important to know that your bi-annual visit could actually save your life. Your mouth is like a window to the rest of your body. Very often, when there’s something wrong with your health, it shows up in your mouth first. Your dentist can often identify some common diseases that your physician may never find. Oral cancer: Oral cancer often starts as a tiny, unnoticed white or red spot or sore anywhere in the mouth. It can affect any area of the oral cavity including the lips, gum tissue, check lining, tongue and the hard or soft palate. Cancers of the mouth are usually first discovered during dental examinations, therefore dentists are at the forefront of saving lives. Heart disease: Infection around the molars (pericoronitis), especially the wisdom teeth, is a strong predictor of heart disease, since the bacteria in the mouth and the plaque the bacteria causes also can appear as plaque in arteries. There is also a connection between gum disease and heart problems. Diabetes: Many diabetics suffer from gum inflammation, infections, dry mouth, periodontal disease (bone loss around your teeth), burning tongue and soft tissue lesions. Kidney failure: Delayed tooth development in children, chronic dry mouth, mouth odor, metallic taste, ulcers on the tongues and gums in adults may be signs to have a doctor check for improper kidney function. Anemia: Some of the earliest signs of anemia are oral symptoms including burning, fiery red tongue, inflamed mucous membranes and difficulty swallowing. Bulimia: Binging and purging stimulate the body to produce acid that destroys tooth enamel. Gum recession and lots of cavities also are indicators. Hypertension: A person with high blood pressure may have gum tissue that looks red or swollen, but there’s no bleeding because increased blood flow will make them swell. Osteoporosis: Dentists take routine X-rays of the mouth area to spot oral health problems, typically no more serious than cavities. However, these X-rays can show jawbones that have eroded and become thinner, a symptom of osteoporosis. As a patient at Caring Smiles Family Dentistry, part of your oral exam will consist of a full examination of all of the tissues of your mouth to look for any signs or symptoms of disease. This is also the time for you to mention to us any abnormalities that you may have noticed in your mouth. If there is any concern during your exam, it is extremely important to follow-up with your dentist as well as your physician for further diagnosis and treatment. Maintaining good oral health will not only improve your smile, but also help you to live a long and healthy life. If you are looking for a dentist, we would be happy to see you. We are conveniently located in the Beaumont Medical Center of West Bloomfield on Orchard Lake Road, between Maple and 14 Mile. Call us at 248-973-8788 to schedule an appointment. We love sharing great dental health tips, contests, and special announcements on our Facebook and Instagram pages. Please join us on our journey of changing lives one smile at a time. Valentine’s Day – Are You And Your Smile Ready? The Most Confusing Aisle In The Store?